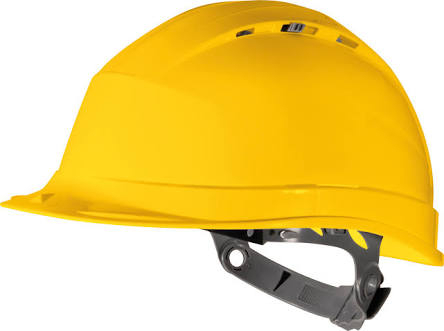 Our safety helmets with the primary function is to protect the wearers head from falling objects are made up of tough Polyethylene and are also light weight for user's convenience. These comply with the universal standards of safety & quality and are carefully designed for user's comfort. The external form of a smooth, free flowing outer shell surface, reflects ergonomic considerations of being well balanced, light weight and also incorporates excellent peripheral vision. These helmets accommodate a range of head sizes with hearing protection, providing hearing protection and face protection in extreme industrial environments. A trustworthy name, Sanctum Work Wear is one of India's reputed manufacturers and exporters of standard and custom made work wear and industrial safety clothing. Our range of industrial safety clothing like industrial clothing, industrial garments, protective clothing, judo uniforms, martial art uniforms, nomex coveralls, safety vests, safety shoes safety vests and shoes are available in various colors, having reflective intensity even when wet. These clothes are essential during night since they offer high safety to user. Industrial Safety Clothing, Industrial Safety Garments, Boiler Suits, Coveralls, Flame Retardant Coveralls, Safety Items, Safety Shoes, Road Safety Items, Industrial Garments, Industrial Safety Wear, Safety Helmets, Nomex Coverall, Safety Products, Industrial Trousers, Safety Jackets, Apron, Tabards, Lab coat.